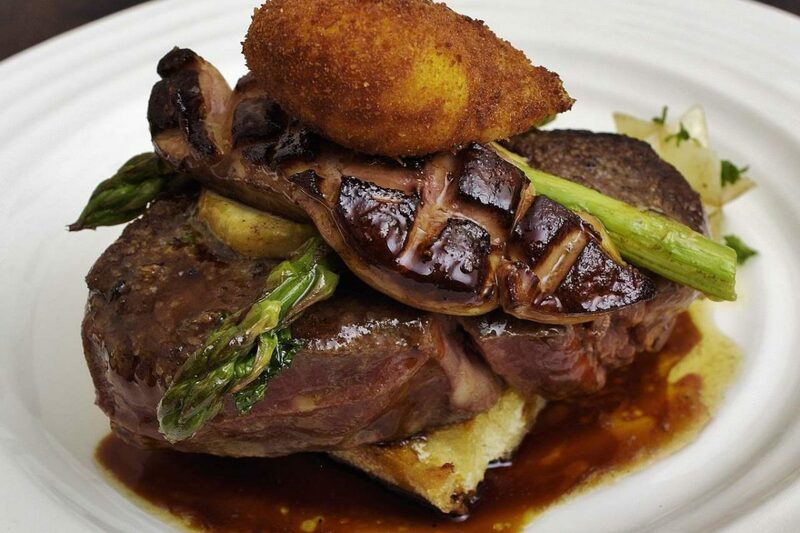 There is a lot to like about beef tenderloin. 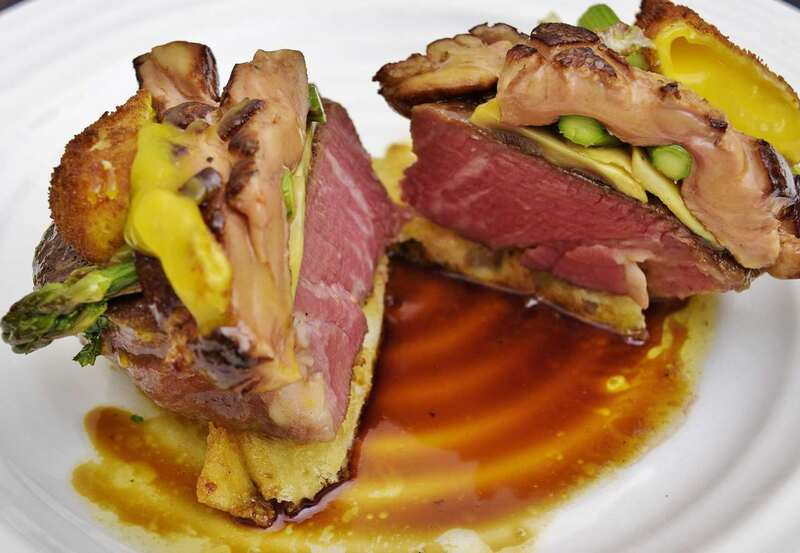 The tenderest of all cuts has myriad applications in haute cuisine and casual stylings alike. 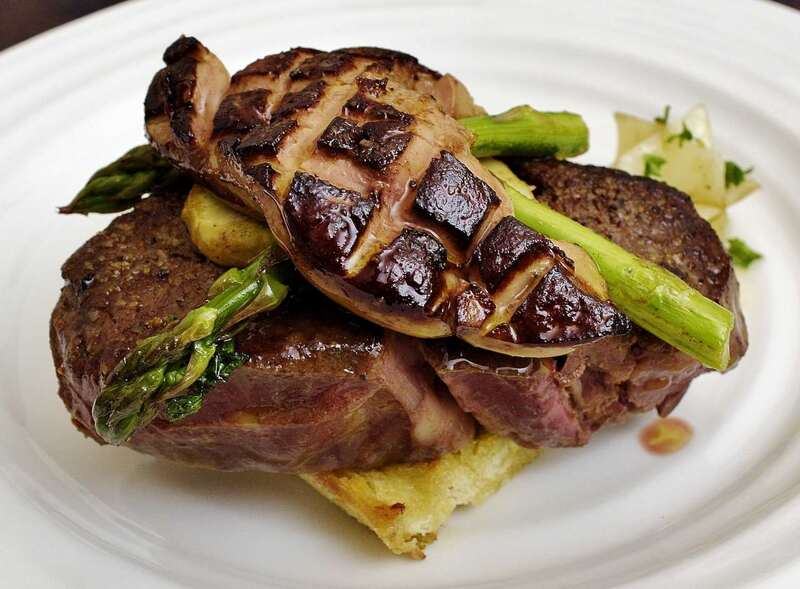 Notes: Butchers will not tell you that the beef tenderloin is one of the easiest cuts to clean–but it is–to know more, click HERE. Beef tenderloin tournedo–typically 3-4 oz/90 g-120 g.
French bread–we used baguette, but any firm bread is acceptable. The slice should be approximately 3″/90 cm square–the same size as your tournedo. Butter, 1 oz/28 g/1 lb/0.8 Kg. 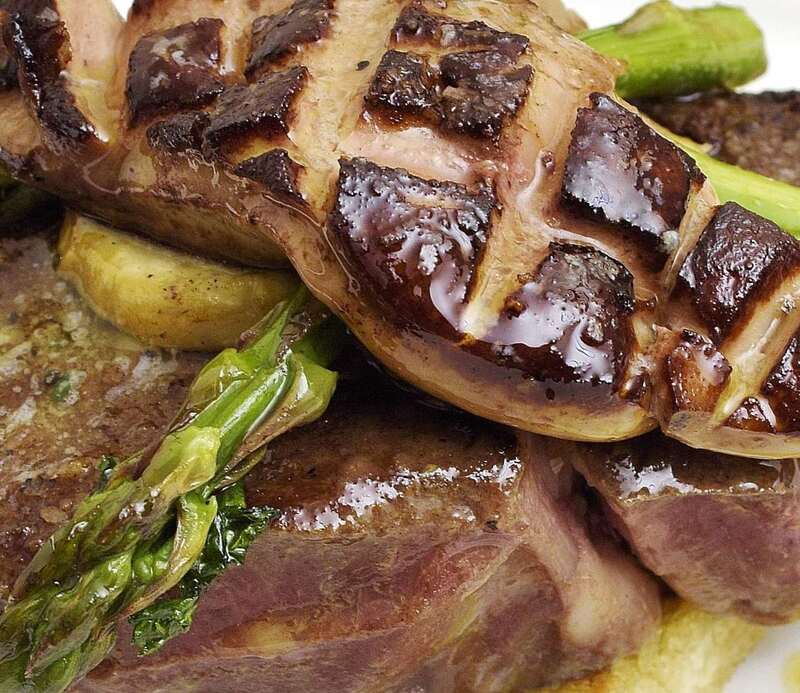 Foie gras, 1 oz/30 g. This is ingredient may be difficult to find and is always quite expensive. 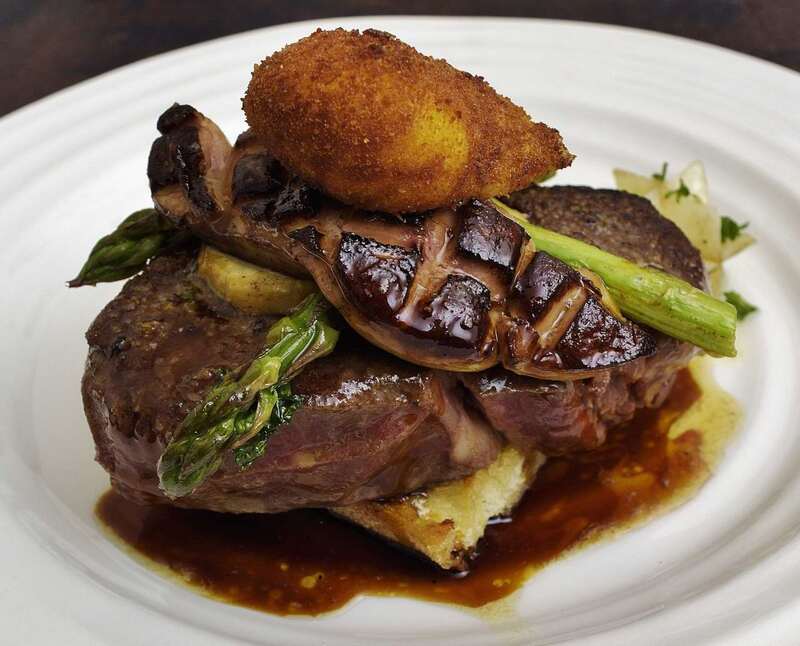 Some chefs substitute chicken livers as an alternative with some success. I prefer omitting it rather than substitute an inferior product. Bread crumbs as needed, make sure you have at least one cup/ 150 g on hand. Stovetop Demi Sauce: 2 oz/60 ml. Madeira or Port wine, 1 oz/25 ml. Cold butter as needed, 2 oz/60 g.
Hawaiian volcanic salt, a sprinkle. Plastic squirt bottle or goose neck. How do you like your Filet? Medium well: 145 F/63 C.
Well done: 150+ F/65+ C.
Add the shell egg to the bath. Seal the potato in a small pouch and set a timer for 5 minutes. Remove the egg when the timer goes off and shock in cold water. Reset the timer for 15 minutes and leave the potato in the bath. When the timer goes off again, REDUCE the temperature to the one that matches your preference; add cold water (or ice) until the temperature comes down to your preferred target. Most chefs prefer to take aim at approximately 129 F/54 C. Sous vide is the only culinary technology that offers this precision. Stage each filet into a dedicated vacuum bag. Seal and sous vide process at the temperature best suited to your preferences for a minimum of two hours. 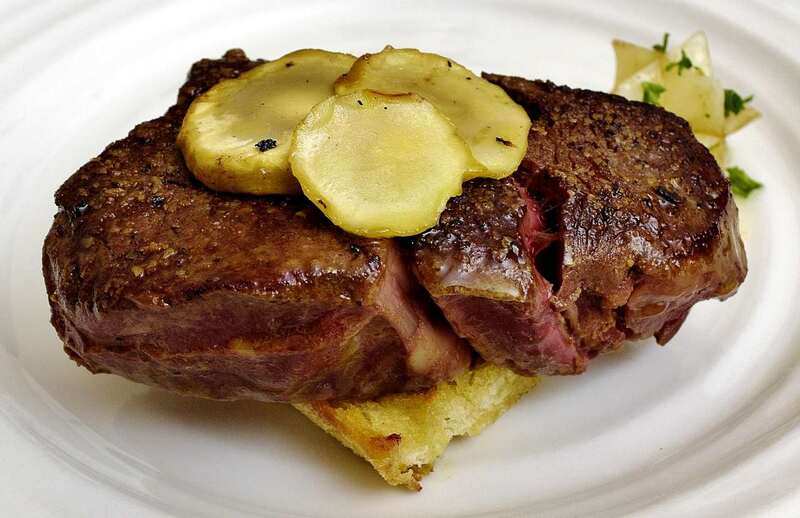 If you want to process more than one steak at different degrees doneness, click HERE. For enthusiasts who like their steaks extremely rare, they can be processed at temperatures as low as 122F /50 C; HOWEVER, in this case the steaks will not achieve pasteurization so the processing time MUST be limited to TWO HOURS in order to meet USDA standards of food safety. The steaks should then be consumed immediately, just as one would if sous vide were not being utilized. While the tournedo is processing, crack the egg into a small bowl. The white should be soft enough to remove without damaging the yolk. Use a small slotted spoon to lift out the egg yolk and lay it very carefully into bread crumbs. Sprinkle a few crumbs on top of the yolk and FREEZE until service. This entire recipe can be prepared in ONE pan without ever delivering it to your dishwasher, with the exception of the deep fried egg yolk. Keep this in mind as you finish each step. Even though I engineered this preparation for one person only, you can easily increase the number of people being served. 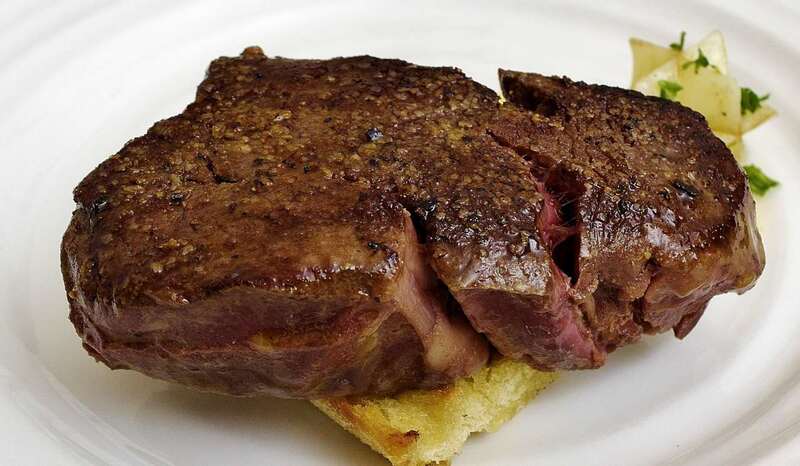 The only admonition is to always make SURE that you do not crowd the pan–everything should touch the bottom of the pan at all times, and there should always be at least 1″/25 mm between each steak or slice of foie gras. Note: As long as the same temperatures are applied, the bath can be used to simultaneously process any number of other products. 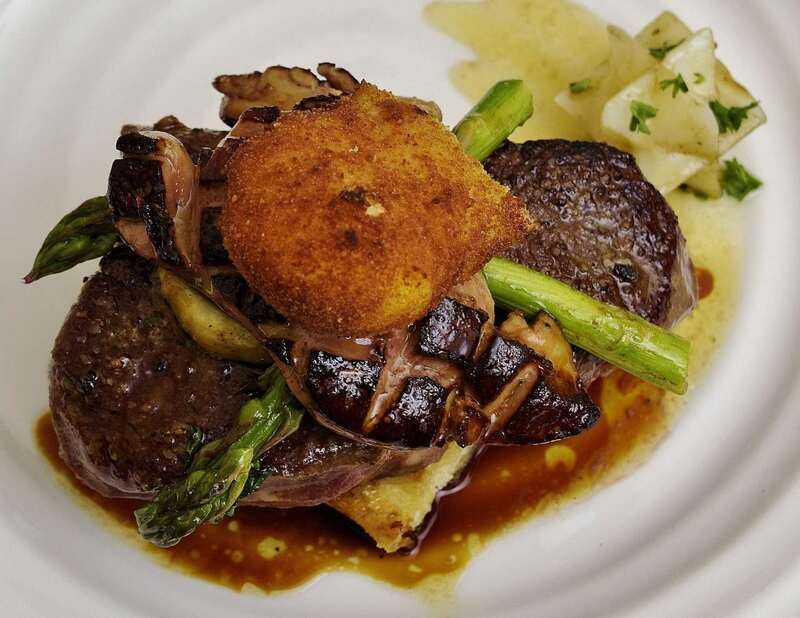 Tournedos for you and your mate, hamburgers for the kids! Below: Processing the tournedo, and also two hamburger patties and a pouch of ready made barbecued beef. Preheat your oven to 183 F/84 C.
Butter the crouton on both sides and toast in the skillet AT 250 F/121 C until browned on both sides. 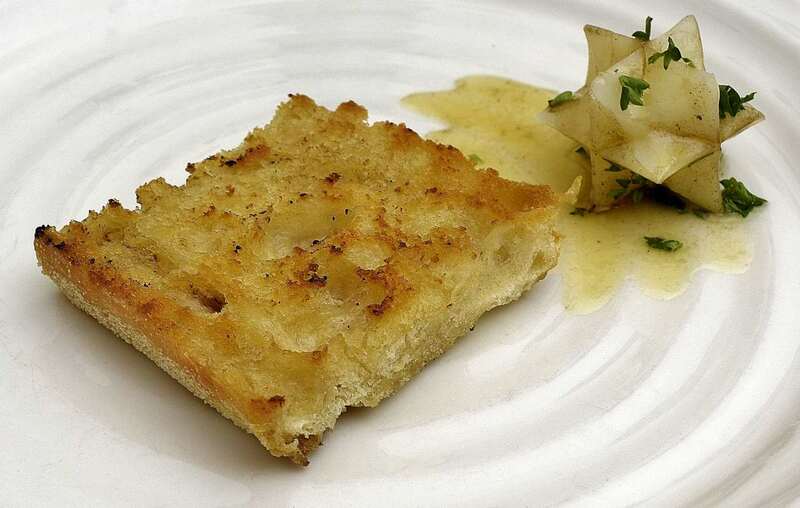 Put the crouton in the middle of the plate. Add the potato to the pan with just enough butter to coat it. Fry until the butter begins to brown. Remove the potato to the plate and stage into the warming oven. Slice the mushroom across the surface so you get distinctly round slices–this represents the truffle slices that usually accompany a classical dish called “Tournedos Rossini.” If you have access to truffles, by all means, use them! Wilt the mushrooms in the pan with a tiny bit of butter and arrange them on top of the steak as shown. Trim the asparagus to 3″/9 cm and peel if necessary. Add to the pan with a tiny bit of butter, salt and pepper and let the asparagus cook for thirty seconds on each side, flipping only once. Arrange the asparagus on top of the mushrooms/truffles. Wipe out the pan with a dry towel to remove any remaining butter. Score the foie gras as shown and add it to the pan. Saute for thirty seconds on each side, flipping only once. Place on top of the asparagus and return the plate to the warming oven. Pour out any excess oil from the foie gras and add the wine to the pan. Reduce the wine until it is almost gone. Wine provides flavor to sauces, but not volume. Once the wine is reduced, add the sauce and melt a few grams of butter into it. Stage into a squirt bottle or goose neck. Dry the pan again and add enough clean vegetable shortening so that it is 1″/25 mm deep. You can save on oil by switching to another pan if you desire, but if you filter the oil through a paper towel in a colander after each use it can be used again. Heat the shortening to 325 F/160 C, remove the egg yolk from the freezer and gently place it in the oil. Flip once if necessary. This step takes less than thirty seconds–only until the yolk is brown. Place the crispy yolk on top of the whole affair. Readers of this treatise have been very patient! I would not leave you without a money shot. or two. Because of the sous vide processing, the egg yolk is pasteurized and completely safe. Even so, I brought it a little closer to “medium” than I might for myself. Unlike most assemblies, this “stack” withstands cutting, at least in half. Chefs neglect to consider which items are “sticky” and which are not–but it matters. It is a shame for a cook to prepare a beautiful presentation, only for it to capsize on its journey to the dining room. Some restaurants require that servers carry but ONE plate at a time (using both hands) to prevent this. If you don’t reduce the wine far enough, your sauce may be purple instead of brown. Again, this is important and worth putting a little extra patience into. You can see the uniform appearance of doneness that sous vide gives you. 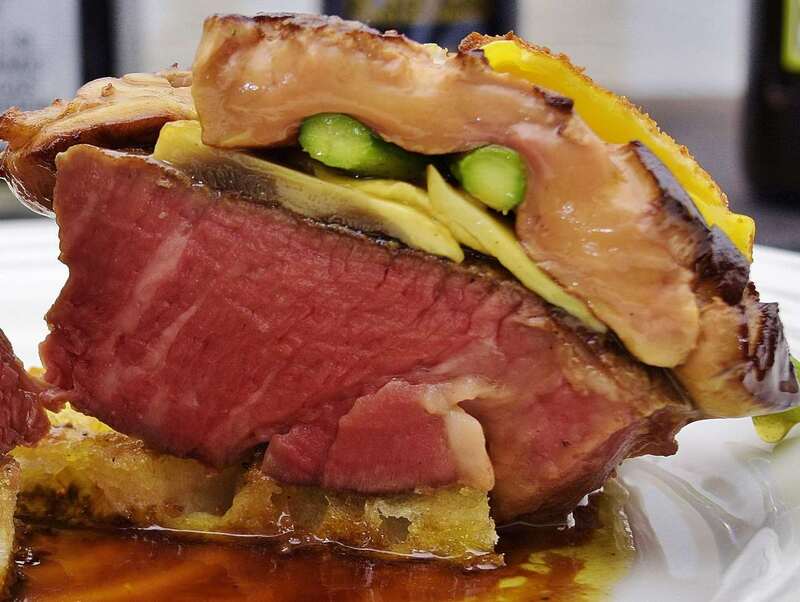 We will not call this Tournedos Rossini, but it is actually very close. Even the finest of restaurants have abandoned proper names for dishes, leaning more towards short succinct listings of the active ingredients. When dishes like this were originally created, labor was much less expensive than food products–apprentices were usually provided with little more than room and board. But it is worth taking that little extra time and putting forth the effort to create a simple but eye pleasing presentation–even when you are only cooking for yourself! The been tenderloin's circumference varies from one end to the other. 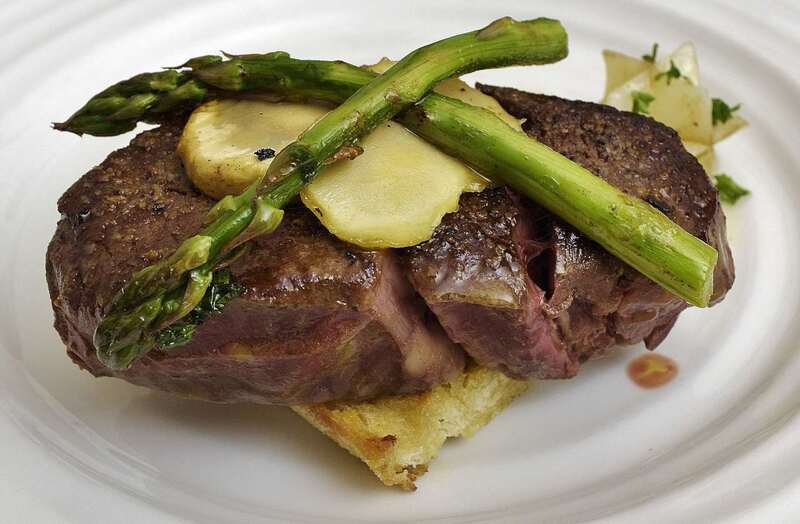 Certain sections are less shape-suitable for the classic "Filet Mignon." This recipe demonstrates how to use the narrower sections. Chain restaurants pay a premium price for pre-cut steaks to avoid dealing with the trimmings. This leaves the broker with the opportunity to "double sell" the remaining sections as brochette meat, London Broil, etc. 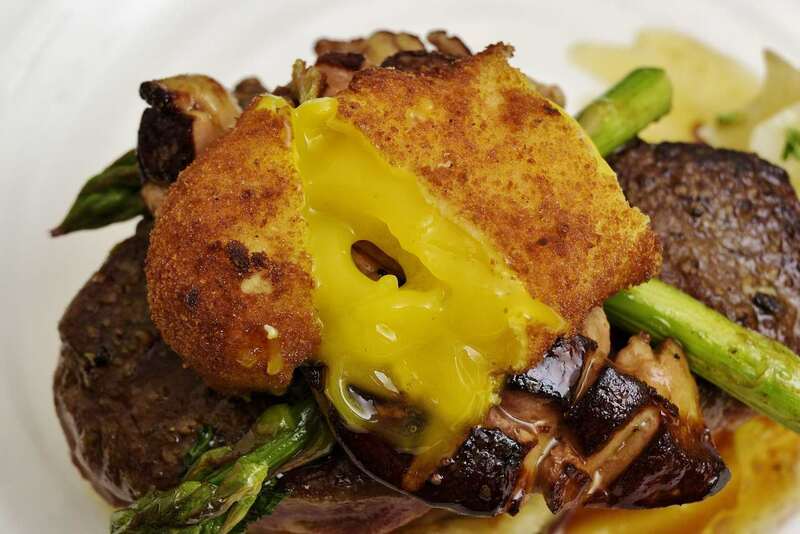 Single owner restaurants offer the "odd-shaped" pieces as tournedos, petite filets, brochettes and even items like Beef Stroganoff. At least they are putting forth the effort to cut their own meat. The personal touch.